The primary cutaneous form of ALCL (PC-ALCL), seen in the image below, is defined by skin-only involvement without systemic dissemination at presentation. However, extracutaneous involvement occurs in 5-10% of patients, mostly to the draining regional lymph nodes. This ulcerated nodule of localized primary cutaneous CD30+ anaplastic large cell lymphoma is relatively nonspecific in appearance. Courtesy of Dr. Ronald Grimwood. The initial diagnostic evaluation of patients with any lymphoproliferative malignancy should include a careful history and physical examination, with close attention paid to the presence of systemic B symptoms, lymph node involvement, organomegaly, and evidence of cutaneous involvement. Immunophenotypic and immunohistochemical studies are critical in the definitive diagnosis of ALCL. Major immunophenotypic features of ALCL include CD30+, CD15-, PAX-5-, and CD45+. Sixty percent of cases express 1 or more T-cell antigens (CD3+, CD43, or CD45RO). 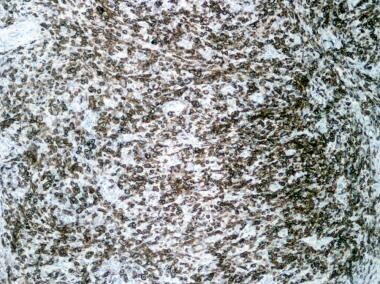 Anaplastic lymphoma kinase (ALK) protein may be detected in most cases (60-70%) of systemic ALCL by immunohistochemistry. Women considering breast implants should educate themselves before agreeing to surgery, and should make sure to discuss the benefits and risks of textured-surface vs. smooth-surfaced implants with their healthcare provider. Women with breast implants do not need to change their routine medical care and follow-up, which should include mammography screening performed by a technologist specifically trained in performing mammograms on patients with breast implants. Women who notice any changes in their breasts should contact their health care provider promptly to schedule an appointment. PC-ALCL has a better prognosis than the systemic type. Around 25% of patients with PC-ALCL show spontaneous regression. Each clinicopathologic subtype can be further classified with respect to morphology, immunophenotype, and antigen markers. In ALK-negative systemic ALCL, the small cell pattern is not recognized. Otherwise, it has similar morphological patterns. ALCL exhibits consistently strong CD30 expression in all clinical and pathologic subtypes. Most tumor cells are of the T- or null-cell phenotype, and the demonstration of clonally rearranged TCR genes, in most cases of T-type and null-type ALCL, suggests that null-type ALCL is a variant of T-type ALCL. B-cell antigenic expression is rare, although it is commonly observed in the HIV-related ALCL. In fact, these B-cell cases are classified separately in the Kiel, REAL, and WHO classifications and are grouped under diffuse, large, B-cell lymphoma. In patients with t(2; 5)/NPM-ALK rearrangement, ALK staining of large cells is both cytoplasmic and nuclear. In the small-cell variant, ALK positivity is usually restricted to the nucleus of tumor cells. In cases with variant translocations, the subcellular distribution of ALK staining varies (membranous or cytoplasmic), depending on the translocation. The majority of ALK-positive ALCL is positive for epithelial membrane antigen (EMA), whereas PC-ALCL typically lacks EMA. This is important in distinguishing between PC-ALCL with extracutaneous disease and the systemic form with skin involvement. Common leukocyte antigen has low expression in the systemic form and is variably expressed in PC-ALCL. PAX-5 is another important marker in distinguishing between the systemic form and Hodgkin lymphoma. In Hodgkin lymphoma, virtually all tumor cells show weak PAX-5 expression which, is not reported in systemic ALCL. Primary cutaneous ALCL is typically negative for ALK staining; however, a few cases ALK positivity in PC-ALCL have been reported. The 2;5 translocation brings the ALK gene portion encoding the tyrosine kinase on chromosome 2 under control of the NPM promoter on chromosome 5, producing permanent expression of the chimeric NPM-ALK protein (p80). This protein, an aberrant tyrosine kinase, presumably triggers malignant transformation via constitutive phosphorylation of intracellular targets. The presence of NPM-ALK serves as an additional diagnostic and subclassification tool for ALCL. Less common ALK fusion proteins associated with ALCL include those resulting from t(1;2), t(2;3), inv(2), and t(2;22). All variants demonstrate linkage of the ALK tyrosine kinase domain to an alternative promoter that regulates its expression. ALK-positive systemic ALCL is relatively less aggressive and carries a better prognosis than ALK-negative systemic ALCL. Primary cutaneous-ALCL is typically ALK negative. However, a few cases with ALK positivity have been reported with similar prognosis. Translocations involving the IRF4 (interferon regulatory factor-4) gene locus, also known as multiple myeloma oncogene-1 (MUM1), have been reported in peripheral T-cell lymphoma not otherwise specified (NOS) and primary cutaneous ALCL. These translocations were rarely found in systemic ALCL and thus can be used to differentiate between these entities. Primary systemic anaplastic large cell lymphoma (ALCL) represents 2-8% of adult non-Hodgkin lymphoma cases and as many as 30% of childhood non-Hodgkin lymphoma cases. [20, 21, 22, 23] Primary cutaneous ALCL is demonstrated in 9% of cutaneous lymphomas. ALCL constitutes approximately 2% of all lymphomas and approximately 9% of high-grade lymphomas in the Kiel registry. It represents approximately 12% of childhood lymphomas and 70% of large cell pediatric lymphomas. A male predominance occurs in cases of primary systemic ALCL that express the anaplastic lymphoma kinase (ALK) fusion protein and in patients whose disease is limited to the skin. Patients with primary cutaneous-ALCL and ALK-negative systemic ALCL are generally older (median age, 61 y) than patients with the ALK-positive systemic ALCL (median age, 24 y). With breast implant–associated ALCL, the median age at presentation is 53 years (range, 25-91 y). When separated by extent of limb involvement, patients with extensive limb involvement had a significantly higher age at presentation (median age, 73 y) compared with those without such limb involvement (median age, 48 y). In primary cutaneous disease, involvement of the lower extremity may be associated with a worse prognosis. Of all cases of ALCL, 15-20% occur in persons younger than age 20 years. In the systemic form of anaplastic large cell lymphoma (ALCL), the translocation t(2;5) results in a novel fusion protein, nucleophosmin (NPM)–anaplastic lymphoma kinase (ALK), which may play an important role in the pathogenesis. The primary cutaneous form of ALCL does not commonly show the translocation t(2;5), and its etiology remains unknown. Most cases of HIV-related ALCL are actually of B-cell origin and seem instead to be related to the anaplastic variant of diffuse large B-cell lymphoma. Many patients demonstrate infection with the Epstein-Barr virus, which is absent in those with the T-cell or null-cell types of anaplastic large cell lymphoma (ALCL). Secondary ALCL evolves from other lymphomas, most frequently from peripheral T-cell lymphomas, mycosis fungoides, Hodgkin disease, or LyP. This form of ALCL tends to arise in older adults, is usually ALK negative, and carries a poor prognosis. Primary systemic anaplastic large cell lymphoma (ALCL) is typically in an advanced stage at patient’s presentation, and the disease is rapidly progressive. These patients demonstrate an increased frequency of bone marrow involvement (30%) and extranodal involvement, including skin (21%), bone (17%), soft tissues (17%), lung (11%), liver (8%), rarely, gastrointestinal tract and central nervous system. Extranodal involvement is more common in anaplastic lymphoma kinase (ALK)–positive ALCL than in ALK-negative ALCL. ALK-negative ALCL has a predilection for the skin, liver, lung, and GI tract. Breast ALCL is also ALK-negative. Breast ALK-negative ALCL possesses an indolent disease course, as opposed to typical ALK-negative ALCL. Systemic symptoms are observed in 75% of patients, with fever the most common symptom. Patients with infiltration into musculoskeletal tissues (eg, psoas muscle) can present with backache. Patients with widespread systemic and cutaneous disease at first presentation should be considered to have the systemic form with skin involvement. Primary cutaneous anaplastic large cell lymphoma (ALCL) usually manifests as a single or localized cluster of erythematous skin nodules (as shown in the image below), some of which may demonstrate superficial ulcerations. [28, 29, 30] As many as 25% of patients have some degree of spontaneous regression of these lesions. Although most cases present with local involvement, patients may, in rare instances, present with disseminated cutaneous disease, in which case they are at higher risk of developing spread to other organs. The imaging and laboratory tests that are necessary to evaluate a patient who may have anaplastic large cell lymphoma (ALCL) are similar to those recommended in the standard evaluation of aggressive non-Hodgkin lymphomas. Complete blood count (CBC) count, peripheral smear review, and bone marrow aspiration and biopsy are standard. Electrolyte evaluations, renal function studies, liver function tests and liver-associated enzyme tests, and uric acid evaluations are appropriate. Serum lactic dehydrogenase (LDH), beta2-microglobulin, and albumin values are useful for prognostic categorization. The LDH and beta2-microglobulin levels also serve as indirect indicators of tumor burden and proliferative activity. Absolute lymphocyte count (ALC) has been reported to be an independent prognostic factor. An ALC below 1000/μL correlates with shorter survival and lower complete remission rate. Chest radiographs are used to assess for lymphadenopathy, pleural effusions, and parenchymal lesions. Computed tomography (CT) scans of the chest, abdomen, and pelvis should be performed for the staging of lymphoma and for differentiating the primary cutaneous form from the systemic form involving the skin. Close attention should be paid to lymphadenopathy (the systemic form of anaplastic large cell lymphoma has systemic lymphadenopathy other than regional lymphadenopathy associated with skin lesions), pleural effusions, pulmonary parenchymal lesions, splenomegaly, and hepatic and splenic filling defects. Ultrasonography of the liver is indicated in patients who have abnormal results from laboratory liver function tests and normal hepatic imaging findings on CT scan images. Gallium scans, although not as useful in the initial staging workup, can be helpful for evaluating the patient’s response to treatment, because continued positive uptake in a residual mass after completion of treatment is an indicator of persistent disease. Magnetic resonance imaging (MRI) can be useful for detecting occult bone marrow lymphoma involvement, which is displayed as patchy distribution and, thus, will be missed on bone marrow biopsy findings. A spinal study is indicated for patients with epidural involvement and possible spinal cord compression. A bone scan is indicated if musculoskeletal symptoms are present or if the alkaline phosphatase level is elevated. Positron emission tomography (PET) scanning is gaining wider approval as a potential staging modality at diagnosis of anaplastic large cell lymphoma (ALCL) and in cases of relapse. Most cases of cutaneous CD30+ anaplastic large cell lymphoma have clonally rearranged T-cell receptor genes. Cytogenetics can be used to detect the t(2:5) translocation. Reverse transcriptase-polymerase chain reaction (RT-PCR) can be used to monitor minimal residual disease. Excisional biopsy of lymphadenopathy is necessary to confirm the diagnosis of anaplastic large cell lymphoma (ALCL). Critical assessments of cell morphology, lymph node architecture, immunophenotype, and molecular and cytogenetic analyses are indicated. Bone marrow aspiration and biopsy are performed to search for occult lymphoma involvement. The morphology of anaplastic large cell lymphoma (ALCL) is similar within its major clinical subforms, the primary systemic and cutaneous varieties. The tumor cells are usually large, with abundant cytoplasm. They manifest prominent nucleoli, display an eccentrically located and pleomorphic nucleus that is often kidney-shaped, and tend to infiltrate lymph nodes in a sinusoidal and paracortical pattern. Cutaneous CD30+ ALCL consists of diffuse nonepidermotropic infiltrates of cohesive sheets of large CD30+ tumor cells. In most cases, the tumor cells may have the characteristic morphology of anaplastic cells, showing round, oval, or irregularly shaped nuclei; prominent (eosinophilic) nucleoli; and abundant cytoplasm. Note the image below. Sheets of atypical cells are seen infiltrating through the superficial and deep dermis. The epidermis is hyperkeratotic (hematoxylin and eosin, 40X). 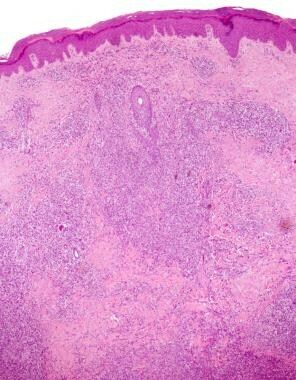 Less commonly, tumor cells may have a pleomorphic or an immunoblastic appearance (see the image below). Reactive lymphocytes are often present at the periphery of the lesions. In some cases, numerous inflammatory cells (eg, T cells, eosinophils, neutrophils) and relatively few CD30+ cells may be observed (LyP-like histology). Epidermal hyperplasia may be prominent in such cases. 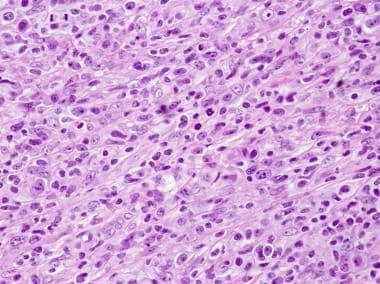 The markedly atypical, large, and pleomorphic epithelioid cells have frequent mitoses. Prominent nucleoli are present (hematoxylin and eosin, 400X). Immunophenotypically, most neoplastic lymphocytes have a unique CD4+, CD8-, and cytotoxic T-cell phenotype (TIA-1 and granzyme B+), with variable loss of pan–T-cell antigens (eg, CD2, CD3, CD5). CD30 must be expressed by most (>75%) of the neoplastic cells. The neoplastic lymphocytes in the primary cutaneous form are usually EMA negative in contrast to the systemic form. CD30+ lymphocytes can be found in certain viral infections, such as human T-lymphotropic virus type I, HIV, hepatitis B and C viruses, Epstein-Barr virus (EBV), and Parapoxvirus infection. No clear-cut distinction exists clinically or histologically between some expressions of LyP and the primary cutaneous form of CD30+ ALCL. This discrimination may be artificial in some cases, because 10% of cases of LyP progress to the clear-cut primary cutaneous form of CD30+ ALCL. Various infectious agents may also have CD30+ cells associated with them, including herpes simplex virus, leishmaniasis, syphilis, scabies, molluscum contagiosum virus, and parapoxvirus (milker's nodule). They may be numerous in tick bites. Lymphomatoid drug reactions may also have these same CD30+ cells. CD30 strongly stains all the malignant cells in the characteristic membranous pattern (CD30 immunostain, 100X). An anaplastic lymphoma kinase (ALK) immunostain can be used to help discriminate between the primary and systemic forms of CD30+ ALCL. Primary cutaneous CD30+ ALCL is ALK positive only in extremely rare instances. Systemic CD30+ ALCL is ALK positive in 50-80% of cases. Because 10-20% of systemic ALCL eventually involves the skin, this differentiation is critical for appropriate staging and treatment. Primary CD30- T-LCL is generally associated with a poor prognosis. Systemic ALCL may stain negatively for ALK, and this is associated with a worse prognosis. In such cases, clinical staging has often been the determinant of whether skin involvement is primary or secondary. LyP and cutaneous CD30+ lymphoma are closely related conditions in which large atypical lymphocytes that have similar immunophenotypic features occur. In LyP, the lesions are papules and nodules that spontaneously involute. Two polar histologic patterns (type A and type B) occur in which the large atypical cells resemble those of Hodgkin lymphoma and mycosis fungoides, respectively, but in many cases, features of both types are present, either separately or in the same lesions. Type C LyP includes lesions that show sheets of atypical mononuclear cells with little admixed inflammatory cells, a histologic picture that is difficult to separate from classic CD30+ ALCL. Variants of LyP include cases with a perifollicular distribution and those with lymphocytic vasculitis or dermal mucin deposits. LyP is associated with a long, benign course of frequent regression of papular lesions. The risk of developing a malignant lymphoma is approximately 10-20%. A loss of response to transforming growth factor-beta, which normally dampens cellular proliferation, favors a diagnosis of CD30+ ALCL instead of LyP. One study showed that CCR3 was expressed by atypical lymphoid cells in 10 (83%) of 12 cases of ALCL but in only 5 (38%) of 13 cases of LyP. CXCR3 was expressed in 11 (85%) of 13 cases of LyP but in only 1 (8%) of 12 cases of ALCL. CCR4 was expressed in 11 (92%) of 12 cases of ALCL but in only 2 (15%) of 13 cases of LyP. RANTES was strongly expressed by lymphoma cells in ALCL (11 [92%] of 12) but was weak or sporadic in LyP (7 [54%] of 13). The presence of CCR3 and its ligand, RANTES, suggests that cutaneous ALCL receives growth stimulation in an autocrine fashion. [39, 40] These markers may be useful to differentiate ALCL from LyP in difficult cases. Lesions of LyP typically show clonal T-cell receptor (TCR) rearrangements; therefore, this is not a useful test to differentiate between these entities. However, 2 subsequent studies showed that MUM1 is expressed equally in LyP and ALCL. [42, 43] Therefore, MUM1 is likely not as useful as once thought. The term "borderline case" refers to cases in which a discrepancy exists between the clinical features and the histologic appearance. These include cases with the clinical presentation of a CD30+ ALCL but with histologic features suggestive of LyP, and, conversely, cases with recurrent, self-healing skin lesions that on histologic examination show a rather uniform proliferation of large CD30+ tumor cells with only a few admixed inflammatory cells, which is characteristic of a CD30+ ALCL. The presence of these cases indicates that CD30+ ALCL and LyP are within a spectrum of primary cutaneous CD30+ lymphoproliferative disorders. Distinguishing between LyP and the primary cutaneous form of CD30+ ALCL is not always possible on the basis of histologic criteria. Thus, the clinical appearance and the course are used as decisive criteria for the definite diagnosis and the choice of treatment. The Cotswold modification of the Ann Arbor staging system is the standard anatomic staging system for non-Hodgkin lymphoma and Hodgkin disease; it is used to evaluate the extent of disease in patients with anaplastic large cell lymphoma (ALCL). Accurate staging allows appropriate therapeutic selection and contributes to predicting the prognosis. It is imperative to rule out systemic involvement in patients with skin disease as management and prognosis is completely different. In addition, every effort should be made to distinguish primary cutaneous anaplastic large cell lymphoma (ALCL) from lymphomatoid papulosis (LyP). LyP is a benign disease with prolonged relapsing and remitting clinical course. However, patients with LyP are at increased risk of various kinds of cutaneous or systemic lymphomas, including ALCL. The presence of ALK gene rearrangement in patients with systemic disease provides both predictive and prognostic information. Solitary or localized primary cutaneous lymphoma is best treated with radiation therapy or surgical excision. Both approaches bring about complete remission in more than 95% of cases. Nonetheless, approximately 40% of the cases relapse within a period of a few months to a few years. Treatment with either of these modalities depends on patient preference, site of disease, and local expertise. Combined-modality treatment (surgery followed by radiation therapy) may prolong the time to first relapse. Spontaneous regression is common. It is reported in 40% or more of patients and does not affect overall outcome. Retinoids (bexarotene), interferon-alfa, interferon-gamma, topical imiquimod, and thalidomide have also been shown to have activity against cutaneous ALCL in case reports or small series. Doxorubicin-based combination chemotherapy stands out as a reference regimen from the trials of peripheral T-cell lymphomas. The CHOP regimen is the most common therapy for systemic ALCL. Therefore, the addition of etoposide to the standard CHOP regimen is an important consideration for young patient with ALK-positive ALCL. Radiation therapy to bulky sites of disease may be necessary after completion of chemotherapy. ALK-positive systemic ALCL is also an attractive target for the small molecule ALK-inhibitor, crizotinib. It was approved for locally advanced or metastatic nonsmall cell lung cancer with ALK gene rearrangement in August 2011. A few cases of relapsed ALK-positive systemic ALCL treated with crizotinib have been reported in the literature. Significant clinical benefit was observed in these reports. [54, 55] Currently a phase 1/2 trial to evaluate crizotinib is under way for relapsed/refractory ALK-positive systemic ALCL. Simple excision, with or without adjuvant spot radiotherapy, may be considered for solitary or localized skin lesions. Local excision may be an alternative to radiation therapy for solitary lesions in either pregnant patients or pediatric patients. Consult a hematologist/oncologist for chemotherapy evaluation. Consult a radiation oncologist for therapy. No limitations on diet or activity are necessary. Although late relapses can occur, patients with diffuse aggressive lymphomas usually experience recurrence within 2 years of completion of treatment. Early detection allows identification of potential candidates for high-dose therapy and stem cell transplantation. Periodic physical examinations and re-imaging are recommended as follow-up care for patients in remission. Long-term survivors need continued surveillance for potential treatment-associated complications. Tumor lysis syndrome (TLS) is a common complication of treatment for any high-grade, bulky, treatment-sensitive lymphoma and occurs after intracellular contents are released rapidly into the blood. The syndrome manifests as renal failure, hyperuricemia, hyperkalemia, hyperphosphatemia, and hypocalcemia; these metabolic derangements may lead to sudden death if left uncorrected. Prophylactic and treatment measures include allopurinol, alkaline diuresis, and correction of potassium and phosphate abnormalities. Patients with bulky or advanced-stage anaplastic large cell lymphoma (ALCL) are at high risk for TLS and should receive prophylaxis, with close monitoring of fluid status, urine output, electrolytes, and renal function. Long-term survivors of non-Hodgkin lymphoma are at increased risk for second malignancies, including all solid tumors, melanoma, Hodgkin disease, and acute myelogenous leukemia (AML). Rare serious complications, such as hemophagocytic syndrome, have been reported. Generally, cutaneous CD30+ anaplastic large-cell lymphoma (cutaneous CD30+ ALCL) has a favorable clinical course (5-y survival rate of 90%), with occasional spontaneous regression (up to 25% of cases) of the skin lesions. The systemic form has a worse prognosis compared with the primary cutaneous form. However, primary cutaneous CD30- large-cell lymphoma also has worse prognosis (5-y survival rate of 15%). Primary cutaneous disease, spontaneous regression, absence of extracutaneous involvement, and younger age at onset (< 60 y) have been suggested to be associated with better prognosis. The expression of either NPM-ALK transcripts or ALK protein is not correlated with prognosis or age in the primary cutaneous form of CD30+ cutaneous lymphoproliferations. However, expression of either NPM-ALK transcripts or ALK protein indicates a better prognosis in the systemic form of ALCL. Prior studies have suggested that the stage of disease may be more important than the cytologic subtype. CD30 ligand expression is detected in regressing lesions only and indicates a better prognosis. Cutaneous CD30+ ALCLs developing from preexistent Mycosis Fungoides are often associated with a poor prognosis (5-y survival rate of 10-30%). Regional lymph node involvement is not necessarily associated with unfavorable prognosis. P53 expression by immunohistochemistry is not associated with spontaneous regression, extracutaneous spreading, or survival. These features are compiled in the International Prognostic Index, which provides stratification into risk groups and serves to identify patients for whom early experimental approaches may be considered. ALK status is also an important prognostic indicator, because ALK-positive cases have demonstrated a significantly improved 5-year overall survival rate of 70-80%, versus 15-45% reported for patients without ALK expression. Localized skin presentation in patients with pure cutaneous disease is associated with good, long-term survival. This is associated with poor prognosis. Absolute lymphocyte count (ALC) has been reported to be an independent prognostic factor. An ALC of less than 1000/μL correlates with shorter survival and lower complete remission rate. The 5-year survival rate is typically around 90% for the primary cutaneous form of CD30+ anaplastic large cell lymphoma (ALCL). In fact, cases of primary cutaneous CD30+ ALCL may regress without therapeutic intervention. The prognosis of the systemic form with secondary cutaneous involvement depends on the expression of the ALK protein. Patients with expression of ALK have a 5-year survival rate ranging from 70-80%. The 5-year survival rate in patients without ALK expression ranges from 15-45%. Survival in children with systemic ALCL also depends on what sites are involved. Mediastinal involvement, visceral involvement, and cutaneous involvement portend a worse prognosis. How is anaplastic large cell lymphoma (ALCL) diagnosed? What is included in patient education about anaplastic large cell lymphoma (ALCL)? What are the subtypes of anaplastic large cell lymphoma (ALCL)? What are the morphological patterns of anaplastic large cell lymphoma (ALCL)? What are the immunophenotypes of anaplastic large cell lymphoma (ALCL)? What are the genetic-molecular characteristics of anaplastic large cell lymphoma (ALCL)? What is the prevalence of anaplastic large cell lymphoma (ALCL) in the US? What is the global prevalence of anaplastic large cell lymphoma (ALCL)? What are the sexual predilections of anaplastic large cell lymphoma (ALCL)? Which age groups have the highest prevalence of anaplastic large cell lymphoma (ALCL)? What causes anaplastic large cell lymphoma (ALCL)? What are the risk factors for anaplastic large cell lymphoma (ALCL)? Which clinical history findings are characteristic of breast implant–associated anaplastic large cell lymphoma (ALCL)? Which clinical history findings are characteristic of primary systemic anaplastic large cell lymphoma (ALCL)? Which clinical history findings are characteristic of primary cutaneous anaplastic large cell lymphoma (ALCL)? Which conditions are included in the differential diagnoses of anaplastic large cell lymphoma (ALCL)? Which tests are performed in the workup of anaplastic large cell lymphoma (ALCL)? What is the role of complete blood count (CBC) in the workup of anaplastic large cell lymphoma (ALCL)? What is the role of blood chemistries in the workup of anaplastic large cell lymphoma (ALCL)? What is the role of absolute lymphocyte count (ALC) in the workup of anaplastic large cell lymphoma (ALCL)? What is the role of chest radiography in the workup of anaplastic large cell lymphoma (ALCL)? What is the role of CT scanning in the workup of anaplastic large cell lymphoma (ALCL)? What is the role of ultrasonography in the workup of anaplastic large cell lymphoma (ALCL)? What is the role of gallium scanning in the workup of anaplastic large cell lymphoma (ALCL)? What is the role of MRI in the workup of anaplastic large cell lymphoma (ALCL)? What is the role of bone scanning in the workup of anaplastic large cell lymphoma (ALCL)? What is the role of a PET scan in the workup of anaplastic large cell lymphoma (ALCL)? How is anaplastic large cell lymphoma (ALCL) differentiated from lymphomatoid papulosis (LyP)? Which molecular techniques are used in the workup of anaplastic large cell lymphoma (ALCL)? What is the role of biopsy in the workup of anaplastic large cell lymphoma (ALCL)? Which histologic findings are characteristic of anaplastic large cell lymphoma (ALCL)? How is anaplastic large cell lymphoma (ALCL) staged? What must be excluded in patients with anaplastic large cell lymphoma (ALCL) prior to initiation of treatment? How is primary cutaneous anaplastic large cell lymphoma (ALCL) treated? How is primary systemic anaplastic large cell lymphoma (ALCL) treated? How is breast implant–associated anaplastic large cell lymphoma (ALCL) treated? What is the role of surgery in the treatment of anaplastic large cell lymphoma (ALCL)? Which specialist consultations are beneficial to patients with anaplastic large cell lymphoma (ALCL)? Which diet and activity modifications are used in the treatment of anaplastic large cell lymphoma (ALCL)? What is included in the long-term monitoring of anaplastic large cell lymphoma (ALCL)? What are the possible complications of anaplastic large cell lymphoma (ALCL) treatment? What is the prognosis of anaplastic large cell lymphoma (ALCL)? What are the prognostic factors for primary systemic anaplastic large cell lymphoma (ALCL)? What is the prognosis of primary cutaneous anaplastic large cell lymphoma (ALCL) with a localized presentation? What is the prognosis of secondary anaplastic large cell lymphoma (ALCL)? What are the mortality rates of anaplastic large cell lymphoma (ALCL)? Dalla-Favera R, Gaidano G. DeVita VT Jr, Hellman S, Rosenberg SA, eds. Cancer: Principles and Practice of Oncology. 6th ed. Philadelphia, Pa: Lippincott Williams & Wilkins; 2001. Vol 2.: 2215-387. Stein H, Foss HD, Dürkop H, et al. CD30(+) anaplastic large cell lymphoma: a review of its histopathologic, genetic, and clinical features. Blood. 2000 Dec 1. 96(12):3681-95. [Medline]. Bennani-Baiti N, Ansell S, Feldman AL. Adult Systemic Anaplastic Large Cell Lymphoma: Recommendations for Diagnosis and Management. Expert Rev Hematol. 2015 Nov 18. [Medline]. Huang BS, Chen WY, Chen CW, Cheng AL, Hong JH, Kuo SH. Relapse Pattern and Treatment Outcome of Curative Radiotherapy for Primary Cutaneous CD30+ Anaplastic Large-Cell Lymphoma: A Retrospective Cohort Study. Acta Derm Venereol. 2015 Oct 14. [Medline]. Breast Implant-Associated Anaplastic Large Cell Lymphoma (BIA-ALCL). U.S. Food & Drug Administration. Available at https://www.fda.gov/MedicalDevices/ProductsandMedicalProcedures/ImplantsandProsthetics/BreastImplants/ucm239995.htm. August 28, 2018; Accessed: November 6, 2018. Brooks M. FDA Issues Update on Rare Breast Implant-Associated Lymphoma. Medscape Medical News. Available at https://www.medscape.com/viewarticle/894279. March 21, 2018; Accessed: April 2, 2018. [Guideline] Willemze R, Jaffe ES, Burg G, et al. WHO-EORTC classification for cutaneous lymphomas. Blood. 2005 May 15. 105(10):3768-85. [Medline]. Zinzani PL, Bendandi M, Martelli M, et al. Anaplastic large-cell lymphoma: clinical and prognostic evaluation of 90 adult patients. J Clin Oncol. 1996 Mar. 14(3):955-62. [Medline]. Benharroch D, Meguerian-Bedoyan Z, Lamant L, et al. ALK-positive lymphoma: a single disease with a broad spectrum of morphology. Blood. 1998 Mar 15. 91(6):2076-84. [Medline]. Lamant L, de Reynies A, Duplantier MM, et al. Gene-expression profiling of systemic anaplastic large-cell lymphoma reveals differences based on ALK status and two distinct morphologic ALK+ subtypes. Blood. 2007 Mar 1. 109(5):2156-64. [Medline]. Diamantidis MD, Papadopoulos A, Kaiafa G, et al. Differential diagnosis and treatment of primary, cutaneous, anaplastic large cell lymphoma: not always an easy task. Int J Hematol. 2009 Sep. 90(2):226-9. [Medline]. Savage KJ, Lee-Harris N, Vose JM, et al. ALK-negative anaplastic large-cell lymphoma (ALCL) is clinically and immunophenotypically different from both ALK-positive ALCL and peripheral T-cell lymphoma, not otherwise specified: report from the International Peripheral T-Cell Lymphoma Project. Blood. 2008. 111:5496-5504. Kim HK, Kim BH, Kim SA, Shin JK, Song JH, Kwon AY, et al. Endobronchial ALK-Positive Anaplastic Large Cell Lymphoma Presenting Massive Hemoptysis. Tuberc Respir Dis (Seoul). 2015 Oct. 78 (4):390-5. [Medline]. Kong YY, Dai B, Kong JC, Lu HF, Shi DR. Neutrophil/eosinophil-rich type of primary cutaneous anaplastic large cell lymphoma: a clinicopathological, immunophenotypic and molecular study of nine cases. Histopathology. 2009 Aug. 55(2):189-96. [Medline]. Massone C, El-Shabrawi-Caelen L, Kerl H, Cerroni L. The morphologic spectrum of primary cutaneous anaplastic large T-cell lymphoma: a histopathologic study on 66 biopsy specimens from 47 patients with report of rare variants. J Cutan Pathol. 2008 Jan. 35(1):46-53. [Medline]. van Kester MS, Tensen CP, Vermeer MH, et al. Cutaneous anaplastic large cell lymphoma and peripheral T-cell lymphoma NOS show distinct chromosomal alterations and differential expression of chemokine receptors and apoptosis regulators. J Invest Dermatol. 2010 Feb. 130(2):563-75. [Medline]. Feldman AL, Law M, Remstein ED, et al. Recurrent translocations involving the IRF4 oncogene locus in peripheral T-cell lymphomas. Leukemia. 2009 Mar. 23(3):574-80. [Medline]. [Full Text]. Bonzheim I, Irmler M, Klier-Richter M, et al. Identification of C/EBPß Target Genes in ALK+ Anaplastic Large Cell Lymphoma (ALCL) by Gene Expression Profiling and Chromatin Immunoprecipitation. PLoS One. 2013. 8(5):e64544. [Medline]. [Full Text]. Gaidano G, Dalla-Favera R. Pathobiology of non-Hodgkin lymphomas. Hoffman R, Benz EJ Jr, Shattil SJ, et al, eds. Hematology: Basic Principles and Practice. 3rd ed. New York, NY: Churchill Livingstone; 2000. 1213-29. Lister TA, Armitage JO. Non-Hodgkin's lymphomas. Abeloff MD, Armitage JO, Lichter AS, Niederhuber JE, eds. Clinical Oncology. 2nd ed. Philadelphia, Pa: Churchill Livingstone; 2000. 2658-719. Pugh WC, McBride JA. . The pathologic basis for the classification of non-Hodgkin lymphomas. Hoffman R, Benz EJ Jr, Shattil SJ, et al, eds. Hematology: Basic Principles and Practice. 3rd ed. New York, NY: Churchill Livingstone; 2000. 1263-93.
van Besien K, Cabanillas F. Clinical manifestations, staging, and treatment of non-Hodgkin lymphoma. Hoffman R, Benz EJ Jr, Shattil SJ, et al, eds. Hematology: Basic Principles and Practice. 3rd ed. New York, NY: Churchill Livingstone; 2000. 1293-339. Woo DK, Jones CR, Vanoli-Storz MN, et al. Prognostic factors in primary cutaneous anaplastic large cell lymphoma: characterization of clinical subset with worse outcome. Arch Dermatol. 2009 Jun. 145(6):667-74. [Medline]. Lamant L, Pileri S, Sabattini E, Brugieres L, Jaffe ES, Delsol G. Cutaneous presentation of ALK-positive anaplastic large cell lymphoma following insect bites: evidence for an association in five cases. Haematologica. 2010 Mar. 95(3):449-55. [Medline]. [Full Text]. Madray MM, Greene JF Jr, Butler DF. Glatiramer acetate-associated, CD30+, primary, cutaneous, anaplastic large-cell lymphoma. Arch Neurol. 2008 Oct. 65(10):1378-9. [Medline]. Williams D, Mori T, Reiter A, et al. Central nervous system involvement in anaplastic large cell lymphoma in childhood: Results from a multicentre European and Japanese study. Pediatr Blood Cancer. 2013 May 29. [Medline]. Beljaards RC, Kaudewitz P, Berti E, et al. Primary cutaneous CD30-positive large cell lymphoma: definition of a new type of cutaneous lymphoma with a favorable prognosis. A European Multicenter Study of 47 patients. Cancer. 1993 Mar 15. 71(6):2097-104. [Medline]. Paulli M, Berti E, Rosso R, et al. CD30/Ki-1-positive lymphoproliferative disorders of the skin--clinicopathologic correlation and statistical analysis of 86 cases: a multicentric study from the European Organization for Research and Treatment of Cancer Cutaneous Lymphoma Project Group. J Clin Oncol. 1995 Jun. 13(6):1343-54. [Medline]. Morizane S, Setsu N, Yamamoto T, et al. Ichthyosiform eruptions in association with primary cutaneous T-cell lymphomas. Br J Dermatol. 2009 Jul. 161(1):115-20. [Medline]. Porrata LF, Ristow K, Witzig TE, et al. Absolute lymphocyte count is independent of the anaplastic lymphoma kinase and predicts survival in primary anaplastic large cell lymphoma [abstract]. Blood. 2007. 110:abstract 1335:[Full Text]. Yin CC, Luthra R. Detection of t(2;5)(p23;q35) in anaplastic large-cell lymphoma by long-range nested polymerase chain reaction assay. Methods Mol Biol. 2013. 999:217-22. [Medline]. Benner MF, Willemze R. Bone marrow examination has limited value in the staging of patients with an anaplastic large cell lymphoma first presenting in the skin. Retrospective analysis of 107 patients. Br J Dermatol. 2008 Nov. 159(5):1148-51. [Medline]. Kummer JA, Vermeer MH, Dukers D, Meijer CJ, Willemze R. Most primary cutaneous CD30-positive lymphoproliferative disorders have a CD4-positive cytotoxic T-cell phenotype. J Invest Dermatol. 1997 Nov. 109(5):636-40. [Medline]. Werner B, Massone C, Kerl H, Cerroni L. Large CD30-positive cells in benign, atypical lymphoid infiltrates of the skin. J Cutan Pathol. 2008 Dec. 35(12):1100-7. [Medline]. Medeiros LJ, Elenitoba-Johnson KS. Anaplastic Large Cell Lymphoma. Am J Clin Pathol. 2007 May. 127(5):707-22. [Medline]. Goteri G, Simonetti O, Rupoli S, et al. Differences in survivin location and Bcl-2 expression in CD30+ lymphoproliferative disorders of the skin compared with systemic anaplastic large cell lymphomas: an immunohistochemical study. Br J Dermatol. 2009. 157:41-48. Yamaguchi T, Ohshima K, Karube K, et al. Expression of chemokines and chemokine receptors in cutaneous CD30+ lymphoproliferative disorders. Br J Dermatol. 2006 May. 154(5):904-9. [Medline]. Kleinhans M, Tun-Kyi A, Gilliet M, et al. Functional expression of the eotaxin receptor CCR3 in CD30+ cutaneous T-cell lymphoma. Blood. 2003 Feb 15. 101(4):1487-93. [Medline]. Kempf W, Kutzner H, Cozzio A, et al. MUM1 expression in cutaneous CD30+ lymphoproliferative disorders: a valuable tool for the distinction between lymphomatoid papulosis and primary cutaneous anaplastic large-cell lymphoma. Br J Dermatol. 2008 Jun. 158(6):1280-7. [Medline]. Benner MF, Jansen PM, Meijer CJ, Willemze R. Diagnostic and prognostic evaluation of phenotypic markers TRAF1, MUM1, BCL2 and CD15 in cutaneous CD30-positive lymphoproliferative disorders. Br J Dermatol. 2009 Jul. 161(1):121-7. [Medline]. Hernandez-Machin B, de Misa RF, Montenegro T, et al. MUM1 expression does not differentiate primary cutaneous anaplastic large-cell lymphoma and lymphomatoid papulosis. Br J Dermatol. 2009. 160:713. Assaf C, Hirsch B, Wagner F, et al. Differential expression of TRAF1 aids in the distinction of cutaneous CD30-positive lymphoproliferations. J Invest Dermatol. 2007 Aug. 127(8):1898-904. [Medline]. Kempf W, Pfaltz K, Vermeer MH, et al. EORTC, ISCL, and USCLC consensus recommendations for the treatment of primary cutaneous CD30-positive lymphoproliferative disorders: lymphomatoid papulosis and primary cutaneous anaplastic large-cell lymphoma. Blood. 2011 Oct 13. 118(15):4024-35. [Medline]. [Full Text]. Schmitz N, Trumper L, Ziepert M, et al. Treatment and prognosis of mature T-cell and NK-cell lymphoma: an analysis of patients with T-cell lymphoma treated in studies of the German High-Grade Non-Hodgkin Lymphoma Study Group. Blood. 2010 Nov 4. 116(18):3418-25. [Medline]. Escalon MP, Liu NS, Yang Y, et al. Prognostic factors and treatment of patients with T-cell non-Hodgkin lymphoma: the M. D. Anderson Cancer Center experience. Cancer. 2005 May 15. 103(10):2091-8. [Medline]. d'Amore F, Relander T, Lauritzsen GF, et al. Up-front autologous stem-cell transplantation in peripheral T-cell lymphoma: NLG-T-01. J Clin Oncol. 2012 Sep 1. 30(25):3093-9. [Medline]. Ferreri AJ, Govi S, Pileri SA, Savage KJ. Anaplastic large cell lymphoma, ALK-negative. Crit Rev Oncol Hematol. 2013 Feb. 85(2):206-15. [Medline]. Ferreri AJ, Govi S, Pileri SA, Savage KJ. Anaplastic large cell lymphoma, ALK-positive. Crit Rev Oncol Hematol. 2012 Aug. 83(2):293-302. [Medline]. Pro B, Advani R, Brice P, et al. Brentuximab vedotin (SGN-35) in patients with relapsed or refractory systemic anaplastic large-cell lymphoma: results of a phase II study. J Clin Oncol. 2012 Jun 20. 30(18):2190-6. [Medline]. Pro B, Advani R, Brice P, Bartlett NJ, Rosenblatt JD, Illidge T et al. Long-Term Remissions Observed in an Ongoing Phase 2 Study of Brentuximab Vedotin in Patients with Relapsed or Refractory Systemic Anaplastic Large Cell Lymphoma. Blood (ASH Annual Meeting Abstracts),. Nov 2012. 120:2745. Horwitz SM, O’Connor OA, Pro B, Illidge TM, Fanale MA, Advani RH, et al. The ECHELON-2 Trial: Results of a randomized, double-blind, active-controlled phase 3 study of brentuximab vedotin and CHP (A+CHP) versus CHOP in the frontline treatment of patients with CD30+ peripheral T-cell lymphomas (oral presentation 997). Presented at the American Society of Hematology (ASH) 2018 Annual Meeting. San Diego, CA. December 3, 2018. [Full Text]. Gambacorti-Passerini C, Messa C, Pogliani EM. Crizotinib in anaplastic large-cell lymphoma. N Engl J Med. 2011 Feb 24. 364(8):775-6. [Medline]. Ordemann R, Stohlmacher J, Beuthien-Baumann B, et al. Use of targeted therapy for refractory ALK-positive anaplastic large cell lymphoma as a bridging strategy prior to allogeneic transplantation. Ann Hematol. 2013 Jan. 92(1):125-7. [Medline]. Dueck GS, Chua N, Prasad A, Stewart D, White D, Vanderjagt. Activity of lenalidomide in a phase II trial for T-cell lymphoma: Report on the first 24 cases. ASCO MEETING ABSTRACTS. Jun 8, 2009. 85:24. Zhang QL, Wang L, Zhang YW, et al. The proteasome inhibitor bortezomib interacts synergistically with the histone deacetylase inhibitor suberoylanilide hydroxamic acid to induce T-leukemia/lymphoma cells apoptosis. Leukemia. 2009 Aug. 23(8):1507-14. [Medline]. Clemens MW, Medeiros LJ, Butler CE, Hunt KK, Fanale MA, et al. Complete Surgical Excision Is Essential for the Management of Patients With Breast Implant-Associated Anaplastic Large-Cell Lymphoma. J Clin Oncol. 2016 Jan 10. 34 (2):160-8. [Medline]. [Full Text]. Laurent C, Delas A, Gaulard P, Haioun C, Moreau A, et al. Breast implant-associated anaplastic large cell lymphoma: two distinct clinicopathological variants with different outcomes. Ann Oncol. 2016 Feb. 27 (2):306-14. [Medline]. [Full Text].